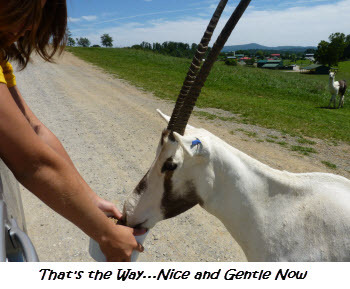 Virginia Safari Park â€“ Is It Worth the Dinero? 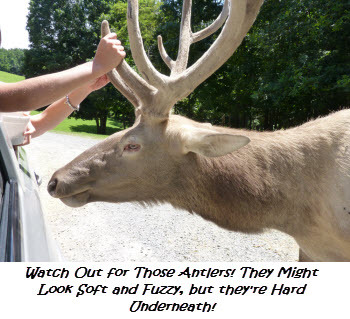 My personal report on the Virginia Safari Park. 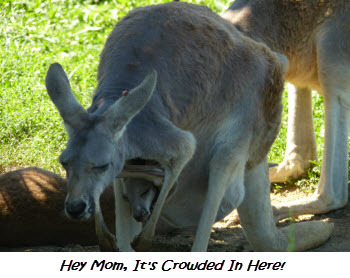 The Virginia Safari Park in Natural Bridge proudly proclaims itself as the “only drive-through zoo” in Virginia! That might be true, but is it worth it to pay $16.95 a person for the opportunity to drive through and see their animals? I must admit, I remained skeptical of the value of such an experience, even though numerous favorable reports kept filtering back my way. My children went with friends, numerous guests of our vacation rental cabins had gone, even my wife Debbie went with her sister from Texas and her four boys. And all came back excited about what a great time they had. Despite these good reports, I continued to doubt. My sister Noreen and my mother came to visit from Florida, and we decided that this was the perfect opportunity for a family adventure. We would go to the Virginia Safari Park, where I could decide for myself once and for all if this really was all it was cracked up to be. But We Had to Eat First! 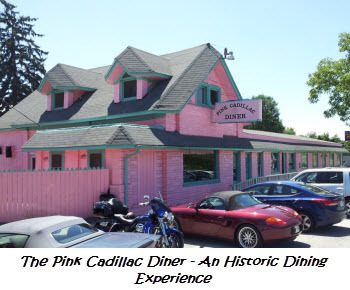 We started off with lunch at the Pink Cadillac Diner, which is another story entirely. Our plan was to visit the Safari Park right after lunch, then to drive home on the Blue Ridge Parkway, stopping off to hike the short way in to White Rock Falls, which my mother and sister had never been to. We never made it to the Blue Ridge Parkway or White Rock Falls! The Virginia Safari Park exceeded all of our expectations, and even cracked its way through my hard shell of skepticism. We laughed non-stop for the hour it took us to drive through, and then spent the next couple of hours exploring the walk-through zoo. As we pulled into the park, we were met by a friendly llama on the right and an inquisitive ostrich on the left. Both were anxious for us to show them our buckets of feed so they could get a snack. It was nice that these initial greeters were among the more “gentle” animals. This allowed us to get a feel for what it was like to hold a small plastic bucket full of feed out the window so animals could eat. We soon discovered that many of the larger animals were rough, requiring us to hold onto our buckets for dear life, as they tried to knock them out of our hands. I’m sure they’ve learned through experience that if they can get us to drop a bucket, all of the feed inside is theirs to munch at their leisure! 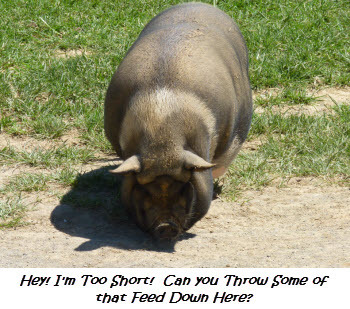 We fed the above mentioned llamas and ostriches, plus many other critters including yaks, watusi, wildebeest, water buffalo, elk, oryx, and more. None were so aggressive as the camels. These humongous critters would bend down and put their heads right inside the vehicle, searching to find more feed buckets. 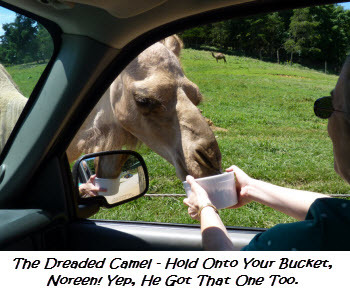 Instead of eating gently and letting us hold the bucket for them, the camels did their best to grab the edge of the bucket and jerk it out of our hands. When they were successful, they consumed the food, and then chewed the buckets until they were an unrecognizable mass of white plastic. I only hope they didn’t swallow them! After spending an hour or so driving through the Virginia Safari Park, we left our vehicle to explore the walk-through exhibits. This was just as entertaining, as we saw giraffes, tigers, kangaroos, monkeys, and a wide variety of exotic birds. 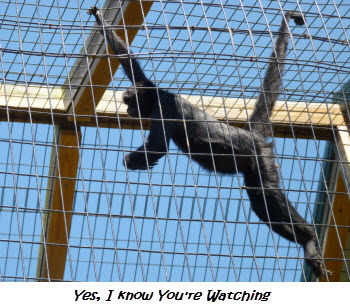 The spider monkeys were extremely active, swinging from ropes, chasing each other all over their cage, and generally monkeying around. We stood outside their cage watching them for the longest time, completely mesmerized by their antics. Our next favorite were the kangaroos. Although they were not very active, we discovered that several had joey’s in their pouches! What a surprise when a little head popped out! I even got a photo! We didn’t feed the birds, but that is an option as well, to purchase Budgie Feed Sticks and let the birds eat from your hand. My Oh My…Where Did the Time Go? Late in the afternoon, we realized that we wouldn’t have time for a hike to White Rock Falls, but the Safari Park and accompanying zoo were so enjoyable we really didn’t care! And besides, we’ll have something to look forward to next visit. All in all, the Virginia Safari Park was an enjoyable experience, one which I now highly recommend.